With its Mediterranean cruise season in full swing through the fall, ultra-luxe Crystal Cruises is highlighting 10 top destinations that are springboards for new excursions in Southern Europe. From exclusive, only-to-Crystal Boutique Adventures that explore the arts to full days of athletic pursuits, nearly 100 brand new Crystal Adventures are available this season in both popular and up-and-coming destinations throughout Spain, France, Italy, the Adriatic, the Canary Islands, and more. The Crystal Adventures are offered on 25 Crystal Symphony and Crystal Serenity sailings from July through December, with savings of up to $4,200 if booked by August 30. 1. Castellón de la Plana (maiden call): Hunt for, then feast upon, black truffles from the Morella countryside. 2. Bilbao: See areas and exhibits typically off-limits to the public, “backstage” at the iconic Guggenheim Museum. 3. Montenegro: Bike the Luštica Peninsula around Kotor, past olive groves and the Adriatic coastline, to a lunch of local specialties. 4. Palermo: Listen to classical strings in the Versailles-like ballroom of a Baroque ancestral palace during an exclusive Crystal-only concert. 5. Marseille: Master the making of French bouillabaisse or enjoy a French impressionist art show deep inside a limestone quarry. 6. Cartagena: Learn to sail, with the magnificent Spanish coastline as backdrop. 8. The Canary Islands: Explore the villages and salt flats of Lanzarote by dune buggy or become a certified (or more experienced) scuba divier in Santa Cruz de Tenerife. 9. 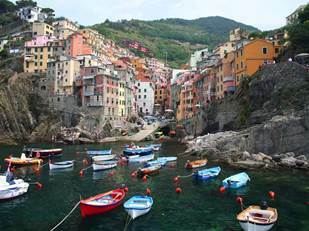 La Spezia (maiden call): Explore Cinque Terre, lunching or wine tasting along the way. 10. Barcelona: Go behind-the-scenes from locker room to dugout at Fútbol Club Barcelona’s famous Camp Nou Stadium. “Whether one is traveling to the area for the first time or his tenth, our collection of adventures offers so many less expected ways to experience the Mediterranean region as never before,” says John Stoll, vice president of land and port operations. The voyages, ranging from five to 29 days in length, are available in shorter, convenient Crystal Getaways and extended combination cruises for additional savings. All-inclusive cruise fares start at $1,950 per guest if booked by August 30. Fares for the new Crystal Adventures start at $48. Crystal’s passion for creating exclusive, eye-opening luxury shore-side experiences are cornerstones of its Crystal Adventures program, earning the line top ratings for two decades. For more information and Crystal reservations, contact a travel agent, call 888-799-4625, or visit www.crystalcruises.com. Among the new “Boutique Adventures” shore experiences Crystal Cruises is debuting is opera up-close with a special operatic performance at the smallest historic public theater in the world. Crystal Cruises, an ultra-luxury cruiseline, is launching a new, “uber-exclusive” collection of “Boutique Adventures” — shoreside experiences only available to Crystal travelers and not available with any other cruise lines. Debuting this spring with its Mediterranean cruises, the intimate Boutique Adventures take guests inside private estates, art studios, museums, castles and well-known businesses for exclusive, insider meals, lessons, workshops, and behind-the-scenes tours with fascinating, eminent local experts. Florence: View the Uffizi Gallery’s private (normally closed to the public) Contini Bonacossi Collection, featuring Bernini sculpture, Bellini and Savoldo paintings, majolica, furniture, and more. Funchal: Lunch with a local celebrity at the elegant Reid’s Palace or enjoy a private visit to a family-run Madeiran winery, followed by a leisurely, homemade lunch with the owners. Rome: Create unique souvenir jewelry under the tutelage of a Valentino model-turned-museum jewelry designer, opening her workshop for the first time ever only for Crystal guests. Corfu: Be one of just six guests per outing to receive a private painting lesson from the President of the Corfu Painters Society. 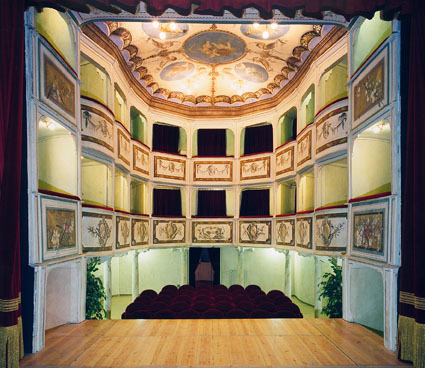 Vetriano (near Florence): Appreciate opera up-close with a special operatic performance at the smallest historic public theater in the world. Sorrento and Taormina: Improve your international kitchen skills via hands-on cooking lessons and meals with local, Michelin-star chefs. Taormina: Dine and listen to a private classical concert at an ancient Sicilian castle. Prices range from $223 to more than $1000 per person, with exact excursion details and pre-booking available online at crystalcruises.com six months before each cruise. Participation is first come, first serve, so early booking is recommended. Plans include Boutique Adventures in Northern Europe, North America, and other destinations throughout the world. For more information and Crystal reservations, contact a travel agent, call 888-799-4625, or visit http://www.crystalcruises.com. Crystal Cruises is introducing a private shore excursion alternative for individualistic adventurers. Crystal’s new “Private Adventure Option” enables guests to take already-organized group excursions – in a more intimate fashion. Beginning this August/September, parties of two, four or six can opt for a personal guide and private vehicle to tour Ephesus, Pompeii or the city of Barcelona, for example – on a shore-side itinerary already carefully crafted by Crystal’s Land Programs team and its worldwide tour operators. Launching August 14 and September 13 on Crystal Serenity and Crystal Symphony, respectively, the “Private Adventure Option” can be pre-reserved at least one week prior to embarkation by emailing crystaladventures@crystalcruises.com. Prices will be at least 25% more than group tour fares, but vary depending on excursion length, vehicle size, guide costs and sites visited. This fall/winter, Crystal ships cruise the Mediterranean, New England/Canada, Panama Canal, Caribbean, Mexican Riviera, Pacific Coast, and Hawaii. Crystal’s huge Fall Fare Sale offers savings up to $8,000/couple. Crystal’s passion for creating exclusive, eye-opening luxury shore-side experiences is a cornerstone of its Crystal Adventures program, helping earn the line top ratings for two decades. For more information and Crystal reservations, contact a travel agent., call 888-799-4625., or visit www.crystalcruises.com.